An artifact or artefact (from Latin phrase arte factum~ars skill + facere to make) is "...something made or given shape by man, such as a tool or a work of art, esp an object of archaeological interest." "Artifact" is the only spelling in American English—"artefact" is common elsewhere (see spelling differences). In archaeology, however, the word has become a term of particular nuance and is defined as: an object recovered by archaeological endeavor, which may have a cultural interest. However, modern archaeologists take care to distinguish material culture from ethnicity, which is often more complex, as expressed by Carol Kramer in the dictum "pots are not people". 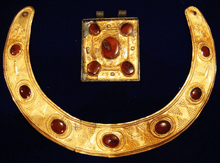 Archaeological artifact from Black Sea region: a Sarmatian-Parthian gold necklace and amulet, 2nd century AD. Examples include stone tools, pottery vessels, metal objects such as weapons, and items of personal adornment such as buttons, jewelry and clothing. Bones that show signs of human modification are also examples. Natural objects, such as fire cracked rocks from a hearth or plant material used for food, are classified by archeologists as ecofacts rather than as artifacts. Artifacts are distinguished from the main body of the archaeological record such as stratigraphic features, which are non-portable remains of human activity, such as hearths, roads, deposits, trenches or similar remains, and from biofacts or ecofacts, which are objects of archaeological interest made by other organisms, such as seeds or animal bone. Natural objects that humans have moved but not changed are called manuports. Examples include seashells moved inland, or rounded pebbles placed away from the water action that made them. These distinctions are often blurred. For instance, a bone removed from an animal carcass is a biofact, but a bone carved into a useful implement is an artifact. Similarly there can be debate over early stone objects that could be either crude artifacts or naturally occurring and happen to resemble early objects made by early humans or Homo sapiens. It can be difficult to distinguish the differences between actual man-made lithic artifacts and geofacts – naturally occurring lithics that resemble man-made tools. It is possible to authenticate artifacts by examining the general characteristics attributed to man-made tools and local characteristics of the site. ↑ "artefact. (n.d.)". Collins English Dictionary - Complete & Unabridged 11th Edition. Retrieved 2 August 2012 – via CollinsDictionary.com. ↑ "Frequency of artefact vs. artifact" – via Google Ngram Viewer. ↑ Carol Kramer, "Pots and Peoples" in; Louis D. Levine and T. Culyer Young (eds. ), Mountains and Lowlands: Essays in the Archaeology of Greater Mesopotamia; Malibu, Undena, 1977; cited in Serge Cleuziou, "Introduction", Objets et symboles: de la culture matérielle à l'espace culturel : actes de la 1re Journée doctorale d'archéologie, Paris, 20 mai 2006, Ed. Laurent Dhennequin, Guillaume Gernez and Jessica Giraud, Paris: Sorbonne, 2009, ISBN 9782859446222. (French). ↑ Peacock, Evan (January 1, 1991). "Distinguishing between Artifacts and Geofacts: A Test Case from Eastern England". Journal of Field Archaeology. 18 (3): 345–361. doi:10.1179/009346991791548645. 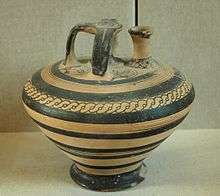 Wikimedia Commons has media related to Archaeological objects.